the addition of a handful of roughly chopped Sea Salt and Turbinado Sugar Dark Chocolate Almonds from Trader Joe's. These are the most addictive bonbons ever to land on the supermarket shelves. 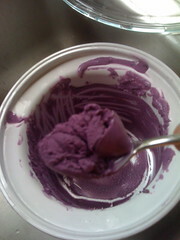 I decided to make this gelato just to limit the number of times we pass by the kitchen cupboard and sneak a couple. Buy 'em, try 'em but be warned, you may have to give them away to save yourself! Heat the cream, milk and sugar until the sugar dissolves. Cook stirring constantly for 5 minutes. Add vanilla and cream cheese. Whisk gently until the cream cheese has melted into the cream mixture. Take a bowl and fill with ice cubes, place the pan in the bowl and allow to cool. Whisk in the sour cream. Meanwhile chop a handful of the almonds. When the cream mixture is cool to the touch pour into an ice cream maker and add the nuts. There you have it, almost every tastebud is tickled: Creamy, Crunchy, Sweet, Sour and Salty Gelato. Enjoy! Oh man. Umm, will that be served!!?!? I can't resist chocolate & almonds! Uh oh, I am going to Trader Joe's this afternoon. The salt and sugar combo bumps up the addiction factor by a gazillion. Almonds=healthy, choc almonds=great endorphins, salt$sugar choc almonds= no self control, plus desire to get everyone else hooked too. Crazy good. I will definitely buy the almonds next time I go to Trader Joe's but you must try their shelled pistachio nuts - salted. I use them in cookes, bars, biscotti, on ice cream with fudge sauce - nothing better. Love the pistachios and thumbs up for chipotle cocoa hazlenuts, too.